GraftCraft has patented the first removable stent. 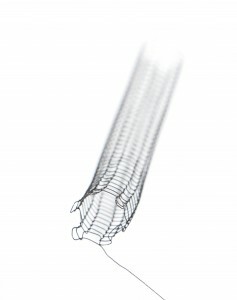 The stent is knitted and will unravel by pulling an extended loose thread, positioned beyond the tubular structure of the stent. The stent will reverse to the thread from which it was made. By placing the end of the thread on the skin surface, the removal can be done without local anesthesia. The removal solves “in-stent stenosis” present with permanent stents. Since no holes are fixed in the tubular formation, side branches can be positioned at any location. This solves a classical problem in the treatment of vascular patients. The Unravelling Stent also introduces new treatment possibilities in the urinary, gastrointestinal and pulmonary tracts. The Unravelling Stent was recently covered by Norwegian national television (NRK), where the principles behind the product and the progress of the pre-clinical study was covered. Watch the clip in the video below! The new treatment possibilities will reduce length of hospital stays, make procedures minor which in turn will offer more patients a possibility to be treated. The Unravelling Stent is a cost-saving alternative as well as a way to improve quality of life for patients.